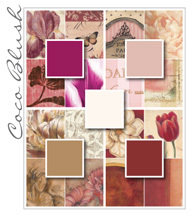 Coco Blush blends soft neutral tan, taupe, and brown hues with warm colors heavily influenced by fuchsia and pink. The demure and feminine feel fits naturally with floral subjects, whether they are used in a traditional or contemporary style. Coco Blush is a beautifully elevated style. Neutrals, including grey and black, together with color contrast form the elegant flowing shapes within the color-filled pallet. Endlessly versatile, this pallet can be expressed in natural textures like animal skin patterns, textured stone, architectural forms, or the ever-popular floral. Ultimately, color and sophistication are the hallmarks of Coco Blush.